Wireless Range: Up to 30â+ ft. 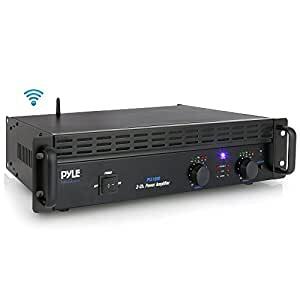 The Pyle Pro Audio Amplifier features high-powered 1000 watt MAX power output. Built-in Bluetooth wireless music streaming ability works with all of todayâs latest devices including Smartphones, Tablets, Laptops and Computers. Hassle-free receiver pairing allow you to stream wireless audio instantly. The ampâs rack-mountable 2-channel design with bridge-ability mode make it perfect for all sound and studio applications. Additional system connectivity features include 1/4” TRS and XLR Input Connectors, Speak-On Output Connectors (A/B/Bridged), and Speaker Terminal / Binding Post / Banana Plug Connectors. Dual ventilation cooling fans, aluminum heat sink and overload protection LED indicators keep your equipment safe and your sound secure. Enjoy reliable sound processing power with the Pyle Bluetooth 2-Ch. Bridgeable Power Amplifier. This two-channel rack-mountable amp’s got power–1000 watts. Each input takes RCA, XLR, or 1/4″ phono. Control each channel with an illuminated knob. A clipping LED reminds you to turn it down if your signal is distorted. Use in stereo, mono, or bridge mode for maximum output. Connect your speakers using the two Speakon inputs, or use the shock-free banana plugs on the back. The heavy duty fan with aluminum heat sink and protection circuit guards your equipment for optimum performance. Your new Pyle pro amplifier gives you the power and versatility you need in a professional sound system. The PTA1000 amplifier’s wide frequency response makes it suitable for amplifying music or vocal program material. It delivers 1000 Watts per stereo channel to give a needed boost to your music, movie soundtracks, or other audio. These controls are used to adjust the input gain of each channel. They determine how loud each channel of the power amplifier will sound for a given input signal level. The maximum input gain is achieved by turning the control completely clockwise–this setting yields the maximum mixer/system headroom. Turning the control back counter-clockwise will yield lower system noise at the expense of mixer/system headroom. Turning the control fully counterclockwise turns this setting off. It is always a good idea to power up any new installing at this setting to protect the system loudspeakers. Built-in power LED indicators illuminate when the AC main power is being supplied to the amp and both channels are operational. If either channel experiences faulty conditions, exceeds safe operating temperature limits, or if the main circuit breaker trips, then both channel power LED will be dark, indicating shutdown. If the BRIDGE mode is selected, the PWR indicator on channel B will remain dark as a positive indication of this mode selection. This heavy-duty, rocker-type switch turns on the power to the amplifier. When the unit is turned on, there is a three-second delay, which reduces/eliminates the turn-on transients associated with the system equipment connected to the amplifier and protects loudspeakers. Shockproof binding posts are provided. For each channel, the outputs are in parallel and the speaker connection cables can be terminated with banana plugs or stripped wires. Two 2-speed DC fans supply cool air to the amplifier. The fans switch to high speed automatically when the unit requires additional cooling. I bought this unit primarily for the case (a bare rackmount case is well over the price of this amp) and particularly because it is so easy to retrofit with other components. It is a dual-mono design with amp modules and heatsinks on either side and a 33/33 toroidal transformer in the center with the power supply unit (PSU). First thing, the fans are NOISY!! If you’ve heard the expression “howl like a banshee”, in comparison to this amp, the banshee would be near silent. Fortunately, the design of this amp is a single 2SC5198/2SA1941 pair for each amp and generates about as much heat as a 5 watt bulb under the worst conditions so unplugging the fans turns it into (… wait for it….) a very nice sounding 70w/ch amp. Speaking of 70w/ch, I put it on my test bench with an 8ohm dummy load and got 70w/ch before clipping set in. Quite an accomplishment. Bridge mode was not so great yielding only 107 watts but as with many amps in this price range, the small power supply capability hampers them. So how does it sound?? Well, pretty much like any other slow A/B solid state amp. It does not turn in a memorable performance with any music and in fact is quite undramatic. Perfect for background music. The Toshiba transistor pair is very common in a lot of low end equipment and for good reason. For me, I did not intend to use this amp for much other than a parts bin. In parts alone, this amp is worth three times the selling price but for those keeping it be aware that it is hampered by poor build quality. The amp modules are of low grade single layer construction and notably, already bowed despite being mounted on their side. The power supply board fares much better. Although did not remove it for a closer look, it is clearly of better quality than the amp boards. The best part is that the rear input/output board is monolithic and connected to the front panel so the amp modules have only power, speaker and pre-in leads. Perfect for a project amp! One last thing. The meter lights might have been useful but they’re calibrated to light when it’s too late. Once the signal light flashes, that’s peak output before distortion rears it’s ugly head. If you see the “vu” meter lights, it’s distortion city. Since this chassis is used for other models, I suspect, they’re not calibrated for the bottom end amp (which this one is). So that’s it. I posted a photo of the internals for the hobbyists (hopefully, they didn’t delete it). Hope you find this info helpful. This is a June 2014 review. Me: I am an avid audiophile. I know what good speakers driven by a class A vacuum tube amp can produce. That’s the gold standard for this review. I went into it on a budget and with eyes wide open, didn’t have $500 or more to spend on an amp, especially an amp that would promise ridiculous wattage and not deliver. This replaced an expensive name brand home theater amp that was supposed to be a 750 watt unit but really only delivered a tiny fraction of that per channel. I have a Pyle 40 and another 15 watt per channel stereo amp that cost peanuts and have stood the test of time. First – my purpose was to drive a couple good speakers from the 70’s rated at 160 REAL watts continuous and 500 peak, to comfortable room filling volume – both for musical use and as a public address system on occasion at our business. I wanted clean sound and a lot of it, but for me a clean REAL 100 watts per channel would be plenty. Next – this pup’s a commercial unit – so it has NO RCA connectors. You’ll need an adapter cable to hook up to a source. Either phono or XLR to RCA. Next – there’s only really one input and no mixing. So for one source, one set of speakers, you’re good. Otherwise you’ll need a mixer or some similar device to select inputs. The results: I got a clean two channel stereo output feeding it with a clean input. I’m using 8 ohm speakers with success, and I can’t relate experience on 4 ohm – but I’d probably not try running 4 ohm speakers with this thing based on my sense of what it is, and the other reviews. As for power output, 1000 Chinese watts is equal to a claim of 500×2 watts at 4 ohms is equal to 250×2 at 8 ohms, says the ad. Reality: with speakers rated at 8 ohms, and half rated power, the thing will probably be longer lived. Sound wise, at full clean output (clipping light on the amp flickers maybe once in 10 seconds) it sounds and feels like a good clean 75-100 watts should with those speakers. In years gone by I’ve driven them with 500 watt per channel vacuum tube amplifiers, and the feel is about right for 75-100 watts. Provided you don’t plan to use the 4 ohm speakers, provided you don’t plan to hook it up and let it rip full power regardless of the distortion, provided you don’t plan to treat it like a crazed teenager – and provided it doesn’t commit suicide all by itself – it works fine. Out of the box, no hum, no surprises. Do plan to turn it down before turning it on or off. Upshot: Good as anything I’ve heard since the early 90’s, if your intention is to run real speakers at decent volume with enough headroom to sound right. If taking your chances for under $100 in the hopes of hitting the jackpot appeals to you, you have come to the right place. Oh, and it has no UL approval or any other approvals I can see. Caveat emptor! Keep in mind that when the description says A and B channels, that each channel is mono. For Stereo output, you need to use Channel A for the left speaker and Channel B for the right speaker. Seems to hum for me at low volume level, but since I am using the unit for outdoor speakers it will not be used that low due to outside acoustics drowning low level sound. Also note the amp does not auto turn on or auto off. You have to use the nice rocker switch on the front. I am using this to power two 100 Watt max Yamaha NS-AW294BL outdoor speakers, so gain is kept low. I did not buy this to get 1000 Watts, but am pretty sure it will be good for a solid 50W per speaker.